Okay, Val again. 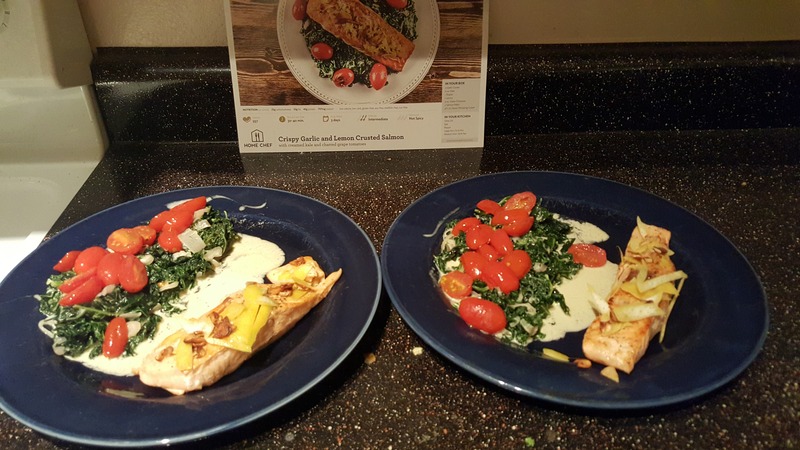 In this blog, I’ll be reviewing my experience with Home Chef, a meal delivery service, and seeing how it stacks up compared to Blue Apron. If you missed the review I did on Blue Apron, you can read about it here. Basically, Home Chef is the same as Blue Apron. Except … it’s so much better! You Can Select Your Meals: Whereas with Blue Apron, you’re limited to just three meals each week and you have to receive all three in a shipment, with Home Chef you can actually select from 10 different meal options each week (some are even meatless). So if you’re not feeling the default delivery options, jump in and switch them out. In addition, there are available add-ons (a la carte style) such as breakfast options and smoothies. Meals are Better: Now this is strictly my opinion, but I have been comparing the meal options for a little over a month now between Blue Apron and Home Chef. And Home Chef has consistently tastier looking meal options. Check out my fave from my first week’s order below! Info about the Chef: For every meal, Home Chef offers up a short bio on the chef who created the meal. This can be helpful once you begin using the service more. If you notice that most the meals you select each week are the creations of a certain chef, it’s fair to say those meals will be good picks for you! So that’s my take folks! Again, I don’t use the meal delivery service all the time (you can still catch me in the grocery store 80 percent of the time), but when I do, it’s Home Chef. I’m such a fan that I actually just cancelled my subscription to Blue Apron! If you’ve used a meal delivery service, tell us about it! Which one is your fave? Let us know in the comments below.